The Hoover Institution today released an essay series by the Shultz-Stephenson Task Force on Energy Policy that lays out a thought-provoking approach to reinventing nuclear power. The task force brought together our nation’s leading nuclear power experts to determine whether a case can be made for nuclear power playing a role in a modernizing grid. "The reality is that we need an economical source of power that is operationally secure and safe while producing zero pollution. At Stanford, we are seeing the research and development of such energy technology game changers on a daily basis. This project outlines a compelling case that new nuclear power can also meet these criteria and warrants a place alongside them," said Hoover Institution distinguished fellow and task force chair George P. Shultz. Nuclear power continues to be a dependable, affordable, and low-polluting power source. Thus the essay series kicks off with comprehensive deliberation concerning small modular reactors (SMRs), a new power plant design that takes existing and proven nuclear technologies and repackages them into a small format that is a better fit for today’s power system needs. SMRs promise to reduce upfront costs and improve safety, though significant barriers remain. 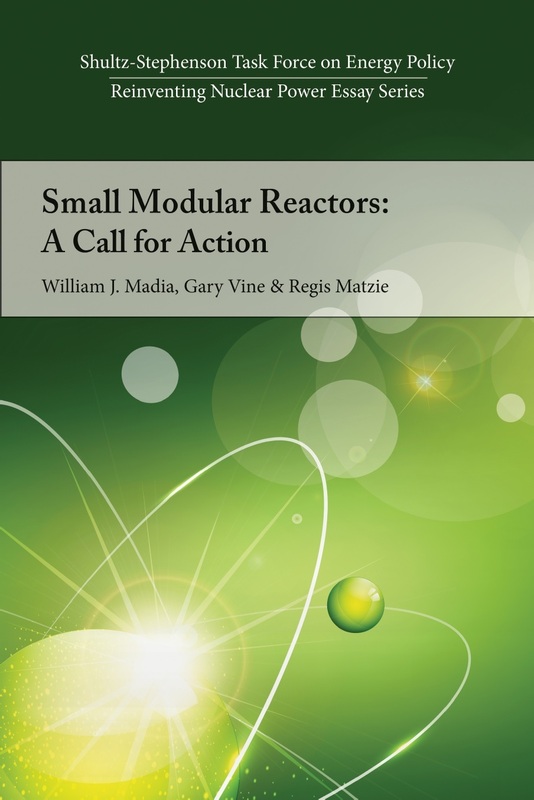 In the series, Stanford University’s William J. Madia proposes strategic changes that, if undertaken, could position SMR technology as nuclear energy’s future. An essay by the Honorable William C. Ostendorff of the US Nuclear Regulatory Commission outlines the regulatory and policy issues surrounding licensing SMRs. By way of background, the Hoover Institution's Shultz-Stephenson Task Force on Energy Policy addresses the full spectrum of energy policy in the United States and its effects on our domestic and international political priorities, particularly our national security. As a result of volatile and rising energy prices and increasing global concern about climate change, two related and compelling issues—threats to national security and adverse effects of energy usage on the global climate—have emerged as key adjuncts to America’s energy policy. The task force explores these subjects in detail. To read in full the task force’s findings related to reinventing nuclear power, visit www.hoover.org/reinventing-nuclear-power. COEDITORS: George P. Shultz is the Thomas W. and Susan B. Ford Distinguished Fellow at Stanford University’s Hoover Institution. He is honorary chairman of the Stanford Institute for Economic Policy Research Advisory Council and chair of the Precourt Institute Energy Advisory Council at Stanford, the MIT Energy Initiative External Advisory Board, and the Shultz-Stephenson Task Force on Energy Policy at Hoover. He served in the Reagan administration as chairman of the President’s Economic Policy Advisory Board (1981–82) and secretary of state (1982–89). James O. Ellis is the Annenberg Distinguished Visiting Fellow and member of the Shultz-Stephenson Task Force on Energy Policy at Stanford University’s Hoover Institution. He retired as president and chief executive officer of the Institute of Nuclear Power Operations in Atlanta, Georgia, in 2012. In 2009 he completed three years of service as a presidential appointee on the President’s Intelligence Advisory Board and, in 2006, was a member of the Military Advisory Panel to the Iraq Study Group. AUTHORS: William J. Madia, chairman of the Board of Overseers and vice president for the SLAC National Accelerator Laboratory at Stanford University; Regis Matzie, a consultant to the international nuclear industry; Gary Vine, a nuclear energy consultant working with Longenecker & Associates; the Honorable William C. Ostendorff, commissioner of the US Nuclear Regulatory Commission; and Amy E. Cubbage, reactor policy adviser to Commissioner Ostendorff.